After deliveries of Tesla’s new Model S and X 100D being delayed by a few weeks due to hiccup at the EPA, they finally started shipping last month and became Tesla’s, and consequently the world’s, longest range all-electric vehicle. 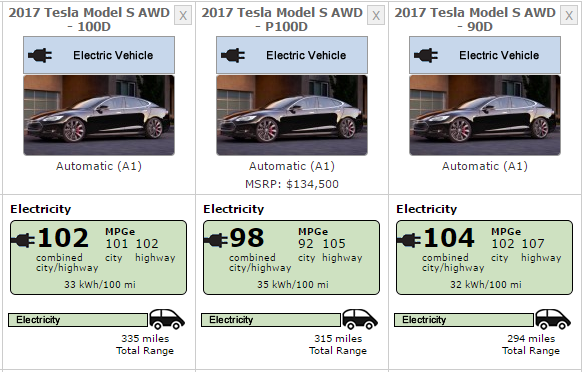 The EPA made it official today by updating their ratings and list the Tesla Model S 100D for 335 miles (539.1 km). Interestingly, while this will be the official information on the EPA fuel economy window sticker, which is required to sell a vehicle, a source at the EPA said that they didn’t perform the confirmatory tests themselves, but instead used Tesla’s manufacturer testing. It’s not too surprising considering the EPA already worked with Tesla on the Model S P100D, which is technically a very similar vehicle. The result in term of efficiency is a combined 102 MPGe for city and highway, which is not enough to beat Tesla’s most efficient vehicle: the Model S 90D. Hyundai’s Ioniq Electric still reigns supreme for efficiency with 134 MPGe, which manages to get 124 miles on only a 28 kWh battery pack. The second best is a significant 12 points behind: BMW i3 with 124 MPGe. Tesla’s next vehicle to be rated is likely going to be the Model 3 and it will be interesting to see how efficiency plays a role in Tesla achieving its targeted range of “more than 215 miles” on a battery affordable enough to get the starting price of $35,000.